Preheat oven to 400°F. Scrub sweet potatoes with vegetable brush, wrap in aluminum foil, then bake for one hour, or until soft. In a medium bowl, mix smoked paprika, chili powder, cinnamon, cocoa, garlic powder, black pepper and salt together. Stir in 2 tablespoons olive oil, then toss in chicken to generously coat. Set broiler on high and move potatoes to lower rack in oven. Place seasoned chicken on broiling pan 6 inches under broiler. Cook for 5 – 10 minutes per side, or until there is no pink inside the thigh and outside has darkened. Be sure to reset the oven back to 400°F after and move potatoes to middle of oven. Set chicken aside to rest and come to room temperature. Once cooled, cut into small pieces. Chop bok choy and red bell pepper and place in medium bowl. In a small bowl, mix 2 tablespoons olive oil with 2 tablespoons fig vinegar. Toss with vegetable mixture. Add the chicken and toss again. To assemble, slice the sweet potatoes open lengthwise and mash the insides slightly. Scoop out 1/3 cup of each sweet potato, then scoop 1/3 cup of the bok choy/chicken mixture into the middle of each sweet potato. Sprinkle with nuts for garnish. 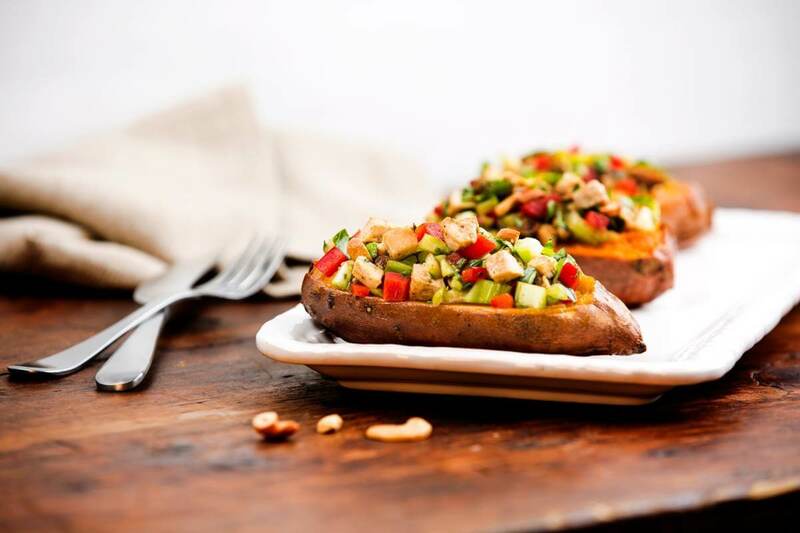 Note: For an extra stuffed sweet potato, keep the 1/3 cup mashed sweet potato or mix in with bok choy/chicken mixture.